The Architects’ Resistance (TAR), an activist network of architecture students and faculty from Columbia, MIT, Yale, and other mostly East Coast schools in the US, emerged from the protests, occupations, and shutdowns of the 1968–69 school year. In its press releases and position papers, TAR described itself as “a communications network, a research group, and an action group . . . concerned about the social responsibility of architects and the framework within which architecture is practiced.” TAR drew inspiration from the flourishing community design movement, and the New Left, civil rights, and antiwar movements, and developed a platform of its own with local and global concerns. In its “Architecture and Racism” campaign (1969), TAR condemned SOM’s lucrative contract with the Anglo American Corporation to design the Carlton Centre in Johannesburg. Architecture for racists, TAR argued, is racist architecture. In “Architecture and the Nuclear Arms Race” (1969), TAR opposed a new fallout shelter building program for architects and educators sponsored by the Department of Defense and endorsed by AIA leadership. In these and other “radical action projects,” TAR excoriated the architectural profession’s submission to corporate, industrial, and governmental interests. TAR argued that the profession had become dominated by a culture of expertise that, in its acquiescence to power, had reduced architecture to a purely aesthetic and technical undertaking. For TAR this was a moral failure: architecture had divorced itself from its ethical responsibility to society. TAR lasted for little more than two years but produced a significant series of documents and events. TAR members also participated in or were connected to other activist groups and CDCs including Urban Deadline, Real Great Society Uptown Planning Studio, Urban Planning Aid, Serve the People, and The New Thing in Art and Architecture. Mapping Feminist LA (MFLA) is a collaborative research project with the goal of building the Angelena Atlas, a crowdsourced map showing intersectional feminist spaces in Los Angeles County. The MFLA collective brings volunteers together every month at the Women’s Center for Creative Work (WCCW) to strategize and discuss the planning of its in-progress map. MFLA began and remains a community program at WCCW, a kindred space that provides the collective with project incubation support. Inspiration for the map draws from physical spaces of the past and present in Los Angeles that connect folks to resources linked to intersectional feminism and anti-oppression movements. MFLA envisions the Angelena Atlas as a springboard for the discovery of places of activism and becoming. Their focus has been collecting information and building towards digital and print maps to include spaces with resources that are anti-racist, anti-ableist, pro-immigrant, LGBTQ friendly, and otherwise empowering. The hope is to foster a new spatial awareness of LA through the lens of intersectional feminism. During its first two years, the collective explored the possibilities and strategies necessary to building a community web project committed to intersectionality. As MFLA now begins digitally building the Angelena Atlas and exits the initial stages of planning and outreach, they are moving forward with like-minded developers and considering open-source technologies. The collective has plans to keep building in iterative stages to include information on spoken languages and live events that these spaces feature. While the final form is still a work in progress, the core values of accessibility and intersectionality will always guide the project as it evolves. The Angelena Atlas will also provide documentation of MFLA’s process and will allow for collaboration through version control and public engagement. In the wake of Whitney Young’s call to action at the 1968 AIA convention, the field of architecture finally began to open to black architects—national and state governments increased coverage to affirmative action plans, black architects founded the National Organization of Minority Architects, and black firms gained more access to government-funded projects. But this was also the era of advocacy planning in New York. The Architect’s Renewal Committee in Harlem (ARCH), one of the best-known examples of an advocacy planning organization, was started in 1964 by Richard Hatcher, a young white architect who was joined by John Bailey, a city planner, in 1967. Max Bond joined ARCH as its new executive director in 1968. This was a period of urban renewal throughout the country, which for many in black neighborhoods meant removal and relocation. ARCH was envisioned as a community facilitator, helping the community communicate ideas of renewal of their own neighborhood. At a press conference, Bond advocated for the creation of a “planning review board of representatives from community organizations” that would enable Harlem to determine if projects planned for their community would, in fact, help the community. ARCH gave voice to residents who had few means to challenge plans being proposed by local government. ARCH was able to examine and explain community development plans proposed by city agencies to the residents and propose new plans that favored those who lived there. Dozens of graduates from Howard University and other HBCUs, as well as socially conscious white planners and architects, flocked to ARCH to work as paid employees or volunteers. In 1970, with Art Symes at the helm, Architecture in the Neighborhoods, a program to recruit local black youth to become architects, was initiated. Architecture in the Neighborhoods offered college scholarships to those who made it through a rigorous prep period. In 1964 President Lyndon B. Johnson announced his plans to end poverty and racial discrimination—to create the Great Society. In that same year, some former members of a Puerto Rican street gang started their own effort to reform society called the Real Great Society (RGS) in New York City’s East Village. RGS leaders declared that they would “fight poverty rather than each other” to address unmet educational, cultural, and community needs. In 1967 RGS organized a branch in East Harlem to represent Puerto Ricans and Latinos in confronting urban renewal and redevelopment plans that threatened to displace them. In 1968, a Columbia University School of Architecture design studio, working with RGS’ Willie Vazquez, dedicated a year to East Harlem issues. It was an effort to have the class of mostly white planning students provide the professional expertise needed for the young Puerto Rican activists to challenge the system. Harry Quintana, a Puerto Rican activist who had attended Howard University’s school of architecture, advanced the view that for the RGS/Uptown Planning Studio (RGS/UPS) to succeed as an architectural advocacy planning group, Puerto Rican architects/planners had to be involved. Approximately ten graduates were recruited. Some observers at the time considered the RGS to be the most progressive community-based organization in East Harlem. Occasionally, RGS/UPS worked with ARCH, a neighboring planning advocacy organization in Central Harlem. In 1969, Harry Quintana representing RGS/UPS, became the face of orchestrated protests with ARCH that led to Mayor John Lindsay’s appointment of the first minority commissioner to the New York City Planning Commission. Funded by federal anti-poverty and private foundation grants, the era of RGS/UPS influence was ending by 1971. But during its time the RGS/UPS planned community gardens, responded to the threat of large-scale housing and educational projects, advanced alternate development schemes, and introduced Puerto Ricans in New York to the concept of community advocacy planning. New York City-based Hester Street is an urban planning, design, and development nonprofit that, among other initiatives, works to prevent the displacement of community anchor institutions by building equity through real estate and social justice. Founded in 2002, the organization aims to preserve vibrant, resilient neighborhoods and build equity at the grassroots. Just as displacement threatens low-income tenants in gentrifying neighborhoods, community-based organizations (CBOs) that serve those tenants are affected by rising rents, lack of protections, and limited capital resources to improve or secure their spaces. Displacement of these neighborhood anchor institutions threatens community well-being by eliminating essential gathering spaces, accessible and affordable services, and often jobs in low-income communities of color. Hester Street manages capital projects for CBOs seeking to secure their spaces for long-term benefit and neighborhood preservation. Over the past three years, they have planned, designed, or developed over 300,000 square feet of community resources: open space, libraries, child care, community centers, and more. Each project is unique and wildly complex, requiring specific skills and careful collaboration between multiple parties. Most are one-time projects for CBOs, which do not regularly develop property and need to keep focus on their missions and programs. New York City commits a large budget to these projects, but they are difficult to access and carry high risks. Hester street helps CBOs tap into and leverage that money while mitigating risks for capital projects focused on the stability and sustainability of neighborhood anchor institutions. Professor Kathleen Coll refers to domestic labor—something that has been long-undervalued in our society—as “the most invisible city engine.” Throughout history, and in many places today, women have had limited educational opportunities resulting in limited professional possibilities, or they have had conflicting immigration status keeping them from pursuing a career or different lifestyle. The intent of La Cocina is to analyze the economic model and the physical space of having a business incubator kitchen in San Francisco, where the domestic cook occupation is recognized and formalized. La Cocina aims to build entrepreneurial independence, and they are doing this through an incubator model. La Cocina continues to break barriers by cultivating food entrepreneurs whose ranks include women, parents, people of color, and immigrants. Their mission is to provide an affordable commercial kitchen space and access to market opportunity to gain financial security by doing what they love. All of this results in an innovative, vibrant, and inclusive economic landscape. La Cocina is situated in the heart of the Mission District, an area in San Francisco undergoing a gentrification and housing crisis. Accordingly, the Mission can benefit from incubator models that address the needs of those in at-risk communities. The concepts prioritized during the design process included natural light to help cooks be happier, healthier, and more productive as well as equal, open flexible kitchen spaces that encourage interaction. Architects/Designers/Planners for Social Responsibility (ADPSR) was founded in 1981 as a voice for architects and design professionals opposing the threat of nuclear war and the militarism of the Reagan administration. Groups of concerned people in the design world soon found each other in New York, Chicago, San Francisco, and other cities, and then the groups united to create a national nonprofit organization with a regular newsletter, chapter meetings, and a national board of directors. ADPSR even formed an international association, ARC-Peace, with representatives from Europe, Japan, and other countries. ADPSR seeks out creative, nonviolent means for raising public awareness and demanding changes in public policy, always from the perspective of designers. An early poster for “Architects for Social Responsibility” (before fellow professions were added) called attention to the stark consequences of a nuclear exchange not only on human life but all of humanity’s cultural achievements—including architecture. A mid-’80s design competition for a bomb shelter mocked the idea that backyard shelters—which the government encouraged at that time—could make any difference. Entries included an “Emperor’s New Clothes” model of an ideal shelter, which was just a blank page. The collection of entries was published under the title “Quonset Huts on the River Styx: the Bomb Shelter Design Book.” ADPSR also arranged an exchange of visits with architects in the Soviet Union, showing through “citizen diplomacy” that even though our two countries’ governments were openly hostile, the people of the two countries themselves could work together peacefully and develop professional and personal collaborations. ADPSR remains active today around issues of human rights and social justice, especially in critiquing the US prison system. 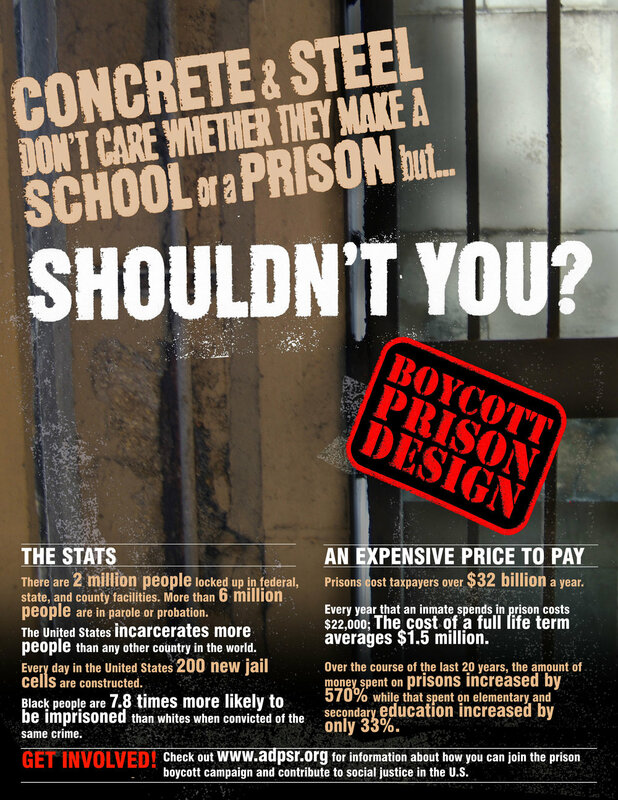 The Prison Design Boycott for Alternatives to Incarceration is a pledge campaign launched by Architects/Designers/Planners for Social Responsibility (ADPSR) in 2004. In some ways a response to the violence and racism of the Iraq war, the Prison Boycott turned the critique of militarism inwards to call out prisons and jails as the architectural embodiment of the domestic war on poor people of color. The Prison Boycott pledge gathered over 1,000 signatures from architects, designers, and allies, demanding an end to the construction of new jails and prisons. It is a private matter for an architect or a firm to decline projects they feel are morally or politically unacceptable, but it is a public reckoning to demand that one’s profession as a whole cease such projects. The Prison Boycott asserted that professional ethics are a ground for collective action, grounded in the professional charge to act in the public health, safety, and welfare. ADPSR expanded the Prison Boycott in 2012 with a petition demanding that the American Institute of Architects (AIA) prohibit members from designing execution chambers and prison spaces for solitary confinement. A campaign highlight was a design competition for posters, with the winning entries mailed to deans of the 100+ schools of architecture across the United States for display in their schools. After six years of rejection, denial, and exclusion, AIA’s 2018 Code of Ethics was changed to prohibit members from ”wanton disregard of the rights of others” under the heading of human rights. This victory marks a success of intersectionality, having been driven as much by demands for AIA to address sexual harassment and gender discrimination as by human rights concerns for people in prison. More work is needed to ensure that the role of human rights within the AIA Ethics Code is widely understood, respected, and enforced. The NYC LGBT Historic Sites Project is a cultural heritage initiative and educational resource documenting historic sites connected to the LGBT community in New York City. Historic preservationists Andrew Dolkart, Ken Lustbader, and Jay Shockley founded the project with initial support from the National Park Service Underrepresented Communities Program. The project builds off of the nation’s first map for LGBT historic sites in New York City, which they helped create in 1994 while part of the Organization of Lesbian and Gay Architects + Designers (OLGAD). The project’s mission to make an invisible history visible includes publishing historical narratives on its website, researching and nominating LGBT sites to the National Register of Historic Places, curating walking tours, presenting lectures, engaging the community through events, and developing education opportunities. The project website features a map with over 150 diverse places from the 17th century to 2000 that are important to LGBT history and illustrate the community’s influence on New York City and American culture. Last year, the NYC LGBT Historic Sites Project worked with the National Parks Conservation Association to develop the LGBT History Tour, Greenwich Village NYC. This printed tour and map is being distributed at the Stonewall National Monument, which memorializes the Stonewall Uprising of June 1969, considered a key turning point in the LGBT rights movement in the United States. More recently, in partnership with the New York State Historic Preservation Office, the project completed the Historic Context Statement for LGBT History in New York City, which will be used as a guide to help future advocacy and evaluation of LGBT place-based history. The project disseminates its content through social media channels, community presentations, and walking tours in order to show the public that LGBT history is American history. This has helped influence new research projects and raise awareness about pre-Stonewall LGBT place-based heritage. It also fosters a sense of pride among LGBT youth. The project is part of a new group of independent projects throughout the country and internationally that are looking more closely at LGBT place-based heritage. The Open Architecture Collaborative (OAC) is a global learning network mobilizing architects and designers with technical skills to build capacity within communities experiencing systemic marginalization.The organization’s programs bring people from different backgrounds together to cocreate a new narrative of power in our contemporary environment through accomplishing small projects. Programs include the volunteer Chapter Network and Pathways to Equity, a design leadership experience for social equity launched in 2018. All programs support local practitioners working their local communities. The OAC was born from the network of Architecture for Humanity in 2016 and maintains twenty volunteer chapters located around the globe, with thirteen located in the US. Informed by over fifteen years of volunteer coordination, community project management, and advocacy, the organization identified a need to develop more rigorous training and focus on building resources to help practitioners develop a lens for equitable practice. In order to deepen the impact of community design for everyone from community partners and local residents to designers, all OAC members must develop a better understanding of the systems of oppression that lead to the projects we often undertake. Pathways for Equity is designed to build an equity lens in design. Supported by the National Endowment for the Arts, the Curry Stone Foundation, and the Association for Community Design. Pathways to Equity brings together an interdisciplinary cohort of fellows to develop skills such as self-reflective practices and resetting frameworks around privilege, power dynamics, and systemic racism. The OAC is committed to providing leadership opportunities and programming for those who want to be the change-makers and problem-solvers in the fight for a more inclusive, diverse, and equitable society. Shortly after graduating from Carnegie Mellon University in 1982, I began working at Skidmore, Owings & Merrill (SOM). I was openly gay from the very beginning, but some of my colleagues were closeted and at that point, I was the only employee who was completely out. There was even a closeted partner who had never been married and still lived with his mother. Now today, of course, people there are fully out, and it’s a good working environment. From my first year there I had a yearly beach picnic day for my SOM colleagues every summer in Fire Island Pines. It was a fun education for some of them to be in the middle of this almost completely gay community. It put most of them in the awkward position of being the minority for the first time, and they were smart enough to be aware of that and collegial enough to accept it as a teaching moment. During this time I was also involved in community activism and more direct forms of protest. I regularly participated in demonstrations by AIDS Coalition to Unleash Power (ACT UP) before it even became ACT UP. I vividly remember a protest at the Statue of Liberty Centennial in 1986 where we marched without permits and the police tried to stop us. I was there with a friend in the group, and we couldn’t get through because the police were blocking us. I realized that if we broke up and melted into the crowd, we could reconvene. The word went through the crowd to break up into ones and twos and reform at a nearby statue. As the whispering went around, somehow the chant started up, “Ones and twos, ones and twos, that’s the way they took the Jews.” It was really frightening, many people were horrified, and some began crying, but it worked, and we got away from the police. We made it down to Battery Park. It felt victorious for a moment, but there were network news cameras next to us, and they would not film us because of what our signs said. They refused to publicize or even report that this was happening. There was very little support, and some bystanders were openly and aggressively hostile. This was a time of great awakening in the LGBTQ community with the birth of many community organizations, some responding to the AIDS crisis and others dealing with professional and social issues. I was one of the founding members of the Organization of Lesbian and Gay Architects and Designers (OLGAD) under the leadership of another architect, Daniel Lansner. Dan called a meeting at the LGBTQ Community Center in New York to see who would show up. We were all surprised to have nearly 100 attendees. I helped facilitate that first meeting along with Dan, Jane Greenwood (2017 Out 100 awardee), and others; we all continued to work with the organization, and I focused on the administrative structure, outreach and interface with mainstream professional organizations. OLGAD grew quite large for a while—in the several hundreds. We were all probably in our twenties or early thirties when we formed it; many older architects and designers were too closeted to even want to be seen in the Center, and many of those who did attend did not want their names to appear on any lists. I was able to host a number of meetings and events at the offices of SOM with the knowledge and approval of the partners, and several other members were also able to host events at their firms. During this time there was a lot of advocacy around all gay issues, particularly driven by the desperate need to address what we now know was the growing HIV threat. It was a very challenging time. A lot of people were dying; horribly, gruesomely, in pain and afraid. There was a lot of fear even among those who were seemingly healthy, because for a very long time, no one even knew what the transmission modes for HIV were, or the variably long incubation period. Before we even called it HIV, AIDS was still commonly used, but before that, it was gay-related immune deficiency (GRID), and even earlier just “gay cancer,” stigmatizing the entire community. One of the weirder parts of the epidemic was that it outed people. A large percentage of the community was in the closet at this time. Architecture in general—and interiors in particular—was known for having a larger percentage of gay people, but as I experienced in my firm, many of these people were deeply closeted. When HIV started to cull that group, it became obvious that there were a lot more gay men in the profession than people even realized. An entire generation was decimated by HIV. It did, and sadly still does, affect people in all walks of life, but it seems that the visual and performing arts were hit particularly hard. At SoHo’s Gallery 91 in 1994 there was an exhibition dedicated to architects taken by the disease with a wall of names of architects, planners, and designers who had died of HIV. I remember writing the names of a couple of fellow alumni from Carnegie Mellon. At that period, I think if you were not active in some way, you would have been ashamed of yourself. It was just impossible not to become an activist in the face of government inaction and social approbation. One of the worst things I ever heard said in my life was that while it was a terrible disease “it was killing all the right people.” It wasn’t the mainstream civil rights movement of the ’60s or the first flowering of the gay rights movement of the early ’70s, but it was the second, maturing gay civil rights movement that was driven, as much as anything, by HIV. It wasn’t possible to just sit back and do nothing. There were too many issues, there was too much injustice, there were too many people dying. You had to get up and do something. My perception is that the degree of involvement was far greater than it is now. I sincerely hope it doesn’t take another crisis to shock our community into action again. I always admired Virginia Woolf’s short 1928 essay, Shakespeare’s Sister. There, she postulates the struggles gifted women surely faced throughout history through a tale of an imagined sister to the famed bard. While a work of fiction, it illustrated an ongoing truth. In thinking about my profession, it occurred to me that the architectural parallel to Woolf’s essay would concern Palladio’s Sister—and that contemporary women architects represented the descendants of this imagined woman—whom we named Judith. This became the impetus for an exhibit that aimed to move the discussion of women and architecture forward. “It would have been impossible, completely and entirely, for any woman to have designed the buildings of Palladio in the age of Palladio. “Let us imagine, since the facts are so hard to come by, what would have happened had Palladio had a wonderfully gifted sister, called Judith, let us say. Palladio himself was, it is well known, a wild boy who apprenticed to a stonecutter in Padua when he was 13 years old and broke his contract after only 18 months. That escapade sent him to seek his fortune in Vicenza. He had, it seemed, a taste for architecture. He was engaged by Gian Giorgio Trissino, one of the period's leading scholars, where he read Vitruvius and Leon Battista Alberti - and learnt the elements of art, architecture and design. Very soon he began designing villas and soon became a successful designer of churches. He lived at the hub of the universe, meeting everybody, knowing everybody, practicing his art on the drawing boards, exercising his wits in the streets, and even getting access to the palace of the pope. “Meanwhile his extraordinarily gifted sister, let us suppose, remained at home. She was as adventurous, as imaginative, as agog to see the world as he was. But she would not have apprenticed and not found a mentor. She had no chance of learning art, architecture and design, let alone of reading Vitruvius and Alberti. She picked up a portfolio now and then, one of her brother's perhaps, and studied the drawings. But then her parents came in and told her to mend the stockings or mind the stew and not moon about with drawings and papers. They would have spoken sharply but kindly, for they were substantial people who knew the conditions of life for a woman and loved their daughter - indeed, more likely than not she was the apple of her father's eye. Perhaps she sketched some plans up in a tomato loft on the sly, but was careful to hide them or set fire to them. Soon, however, before she was out of her teens, she was to be betrothed to the son of a neighboring wool-stapler. She cried out that marriage was hateful to her, and for that she was severely beaten by her father. Then he ceased to scold her. He begged her instead not to hurt him, not to shame him in this matter of her marriage. He would give her a chain of beads or a fine petticoat, he said; and there were tears in his eyes. How could she disobey him? How could she break his heart? The force of her own gift alone drove her to it. She made up a small parcel of her belongings, let herself down by a rope one summer's night and took the road to Rome. She was not seventeen. The birds that built nests in the hedge were not better at design than she was. She had the keenest eye, a gift like her brother's, for the design of space. Like him, she had a taste for architecture. She stood at the studio door; she wanted to draw, she said. Men laughed in her face. The master builder - a fat, loose-lipped man - guffawed. He bellowed something about poodles sawing wood and women drawing - no woman, he said, could possibly be an architect. He hinted - you can imagine what. She could get no training in her craft. Could she even seek her dinner in a tavern or roam the streets at midnight? Yet her genius was for architecture and she lusted to feed abundantly upon the spaces that housed the lives of men and women and study their details. At last - for she was very young, oddly like Palladio the architect in her face, with the same grey eyes and rounded brows - at last Nick Greene the architect-builder took pity on her; she found herself with child by that gentleman and so - who shall measure the heat and violence of the architect/artist’s heart when caught and tangled in a woman's body? - killed herself one winter's night and lies buried at some crossroads where the omnibuses now stop outside the Roman Forum. The success of CARY’s More than the Sum of our Body Parts clearly demonstrated to me the power of exhibits to spark conversations about important social and professional issues. I was certain that this would not be my only effort to confront issues affecting women in architecture. In 1994, I was invited by New Langton Arts, a San Francisco art gallery, to continue my installation work addressing the status of women in architecture and professional women in general. The result was Architecture Lets In Chicks, Except…(ALICE) Through the Glass Ceiling. With this new multimedia show, I wanted to expand my investigations to recognize the progress women had made while acknowledging that women continued (and continue) to face many challenges in the workplace. ALICE knew that the very metaphor of the glass ceiling indicated that women had made gains. After all, if women had not gotten their collective "foot in the door," they would not be able to see the ceiling at all. But like a ceiling of glass, women’s progress has been fragile, and it was (and is) imperative that these gains not be taken for granted. In Alice Through the Looking Glass, Lewis Carroll’s Red Queen notes that “it takes all the running you can do to keep in the same place. If you want to get somewhere else, you must run at least twice as fast as that.” Entering the exhibit through strips of mirrored mylar, this ALICE’s wonderland was a series of seven playful, interactive, three-dimensional installations showing that women still needed to run at least twice as fast. The vignettes confronted the ways statistics can be interpreted, the differences between media portrayals of women architects and the real work of women architects, the ambiguity of affirmative action programs, the ways that women are made to be invisible, and the challenges of climbing the corporate ladder. Rose Colored Glasses juxtaposed the rosy media versions of women architects and the reality of their actual architectural work. I drafted buildings by nine pioneering women architects—Ruth Adams, Han Schroeder, Alberta Pfieffer, Minerva Parker Nickels, Julia Morgan, Eileen Grey, Marion Mahoney Griffen, Eva Kuhleft-Ekelund, and Mary Elizabeth Jane Colter—and framed these 24 x 36 inch drawings in rose-colored plaster frames. These were contrasted with nine miniature images of women portraying architects—in films, on television, in magazine fashion spreads, and in print ads—clipped to thin cable strung from ceiling to floor. The next layer was composed of nine viewing devices held on stands made of steel plate, coil, and reinforcing rod. Various magnifying glasses, binoculars, monoculars, and telescopes, all covered with rose-colored gels, were connected to the stands. They were focused directly on the media images, placed in the gallery relative to their magnifying capabilities. Whether a woman showing architectural prints to a client whose string of pearls had broken or Elise Keaton (mom and architect) in Family Ties, none of the images came close to the accomplishments of the actual women. As the viewer looked beyond the media mystique, the real work became most prominent. Ambiguity was the central theme of Shining Armor. Even though the whole notion of knights in shining armor is antithetical to professional ambition, it doesn’t necessarily make the concept of such a knight unattractive. Similarly, I had ambiguous feelings about affirmative action. The program offered opportunities to women but often limited these opportunities to consulting with larger, male-owned firms. As the piece evolved, I became interested in times when women wore their own shining armor, and I presented information about affirmative action within a historical context of women taking on their own battles. This large triangular sculpture corner was a patchwork of copper, bronze, steel, aluminum, wire mesh, and perforated metals. It stitched together a history of affirmative action alongside examples of women’s movements, from a twelfth-century harem revolt in Persia to a seventeenth-century riot by women bread bakers in Paris to marches in Washington, D.C. I wanted to express my concern for the ways women have been made to feel invisible in the workplace, whether they are being denied credit for an idea or being left out of a meeting. This led to Smoke and Mirrors, Now you see her, now you don't, and Pick-a-Card, Any Card. In the former installation, slides were projected through gray “clouds of smoke” covering a platform that supported a projector and tape player. A mirror was placed in front of the projector lens to transmit the images horizontally onto another platform suspended from above, appearing to float. The projections were presented in pairs, allowing the viewer to “see her” before she became invisible. For example, Robert Venturi and Denise Scott Brown were shown as professional partners, but then Robert Venturi was shown alone as the recipient of the Pritzker Prize. These slides were accompanied by an audio tape with a magician’s voice revealing tricks used to make women disappear. Adjacent to Smoke and Mirrors, long white-gloved hands were perched on pedestals clad with red satin. One hand cradled blank Red Queen playing cards, inviting gallery visitors to share their experiences with “sleights of hand.” The other glove held the ever-growing hand of cards, where visitors could pick a card to discover other tricks that had been performed on women visitors who had been made to disappear. I have always thought that Crystal Ball was ahead of its time. I wanted to create a means for communication beyond the gallery walls. Small “crystal” beads were strung on silver string, along with a message charm that read, “What do you see in our future? Email ______” and then my email address. Purely conceptual in nature, this piece provided souvenir bracelets, placed in a crystal bowl for all to take. Today I would ask for tweets at #alicethroughtheglassceiling. No one sent an email, but the feedback I did receive assured me that this gallery show struck a nerve for both women and men. In the late 1990s, Boston Society of Architects (BSA) president Rebecca Barnes thought it was time to re-energize a focus on women. This resulted in the creation of the Women in Design (WID) Network. Concurrently, on the national level, the American Institute of Architects (AIA) decided to merge the Women in Architecture and the Minority Architects committees to form the Committee on Diversity. I was pretty sure that women’s voices would be lost in that scenario; yet in Boston a group of women wanted to give women’s voices a place to be heard. And not just “A” (architect) women—but the broader category of “D” (design) women. I was impressed. As the network took shape, Gretchen von Grossman stepped forward with the suggestion that the Conversations—monthly programs sponsored by the WID Network—be given a wider audience. In 2000, she put together the first Women in Design conference, and the event has grown each year since then. I think the last thing the architectural field needs is one more awards program. In fact, I think architecture gives out too many awards. Yet here I was, suggesting to Gretchen, Rebecca, and others that we develop a WID awards program. I wanted to accept a challenge that had been articulated five years earlier. In the introductory essay to CARY’s More than the Sum of our Body Parts exhibit catalog, Dr. Roberta Feldman, professor in the School of Architecture at the University of Illinois at Chicago, stated that architects “cannot expect architecture to become more inclusive without confronting how all architects are educated and kept informed about what is happening in the field as well as how architects receive commissions, carry out their work, evaluate its consequences, and gain recognition.” With a new awards program, I saw a framework by which to confront how architects gain recognition. Over the next several months, I met with many women from the building professions to discuss their definitions of success, their thoughts on what made for a successful career, and what they considered worthy of recognition. Together, we analyzed the criteria used in existing awards programs to get a handle on the underlying assumptions embedded in the criteria for those awards. Was there something about the criteria that, up until that point, made the awards a better fit for men than women? These awards programs included the Pritzker Prize, the AIA Gold Medal, the Royal Institute of British Architects’ (RIBA) Gold Medal, and the AIA/ACSA Topaz Medallion for Excellence in Architectural Education. We asked: was success achieved solely through a singular body of work? Did success come as the result of a well-defined linear path? Was success competitive or collaborative? What makes a career successful? And what makes that successful career worthy of recognition? We identified many shared criteria; additionally, we identified notable omissions from the aforementioned awards’ listed standards: process, collaboration, inclusiveness, and ethics. We wondered if these traits were more apparent to women or more important to women; what we did know was that those concepts were important to us. The results of our research and conversations were summarized in the four “P”s—the four criteria developed for the WID Award of Excellence. Process - Celebrates the "long and winding road"
Many, if not all, of the recipients fill more than one category. I cannot tell you how many people asked me, “Why not just give the award to one person?” The answer was simple. This decision allowed us to celebrate the many ways individuals contribute to the built environment. What we did not anticipate was that the shared experience of each class of recipients elevated the meaning of the award. In contrast to the single-winner award, recipients of the WID award often have expressed how honored they feel to be in the company of that year’s cohort. The annual awards luncheon during the WID conference is joyful and inspiring. Some awardees always knew their professional goals and reached them, some were dissuaded from their goals but found their path back, some explored many avenues before discovering their direction, and others practically fell into the positions that have brought them so much satisfaction. Has this awards program confronted the way architects gain recognition? Has it had an impact on the ways we think about success? Or honor success? For me, these are the ongoing questions. I hope there has been some positive impact—I leave that for others to decide. In the meantime, I am confident that there are many women who continue to be successful and meet the criteria of the WID Award of Excellence. How we address our history affects how we remember it and frames the lessons we learn from the past. Racial violence is often glossed over in school, watered down in textbooks, and sanitized for white America’s convenience. Many Americans, however, are not privileged enough to be able to ignore this part of American history. Violence and terrorism have haunted black communities, particularly in the South, shaping race relations and power structures through policy and psychology. All over the United States, organizations like the Ku Klux Klan targeted black Americans with beatings, bombings, lynchings, and other acts of terror to demonstrate their power and to repress the political and economic action and success of black communities. This violence intensified when the Confederacy was defeated in 1865 and continued with increased intensity until the murder of Emmett Till in 1955. It was only after the media coverage of Till’s open casket—a decision made by Till’s mother to display her fourteen-year-old son’s unrecognizably beaten face—that white Americans began to express outrage and call for justice. MASS Design Group, and Equal Justice Initiative (EJI) created the Memorial for Peace and Justice to finally memorialize the lives lost through these acts of racial terrorism. MASS is a nonprofit architecture firm known for empowering communities through their thoughtful design and work with nonprofits. EJI has been working for twenty-nine years to end mass incarceration, protect the basic human rights of vulnerable communities, and end racial and economic injustice against these groups. The Memorial for Peace and Justice is sited in Montgomery, Alabama, a city with a vital history in both the civil rights movement and the enslavement of African Americans. Pre-Civil War, Montgomery was one of the largest trading posts for domestically sold slaves. During the Civil Rights movement, it was also the city where Rosa Parks sparked the Montgomery Bus Boycott. The Freedom Riders were attacked by a mob at the Montgomery Greyhound station in response to their fight to end illegal interstate segregation. John Lewis led an attempted 54-mile march from Selma to Montgomery, during which his marchers suffered police brutality on the Edmund Pettus Bridge so vicious that 50 protesters were hospitalized after being severely beaten. While the city had dozens of statues and memorials celebrating its Confederate heritage, it was not until 1990 that the city began to use signage and statues to acknowledge its role in the civil rights movement. At the memorial entrance is a quote by Dr. Martin Luther King Jr.: “True peace is not merely the absence of tension; it is the presence of justice.” Passing through the gate, an outdoor path walks you through a brief history of the enslavement of Africans, their treacherous voyage to the Americas, emancipation, and the creation of Jim Crow laws. The pathway is lined with written history and accompanying sculptures depicting the physical and emotional struggles of African Americans leading up to Reconstruction. As the path descends, the roof remains at the same level. By the second side of the pavilion, the boxes float above you. While it very literally represented the way many of these lynchings happened, through hangings, it also symbolized two things to me: the weight of the life lost and the feeling that the names where floating towards the sky, towards freedom. In the third wing, the boxes hang about eight feet from the floor and as the viewer continues to descend, the boxes hang well above them, at about twelve feet. Along the walls are plaques detailing what triggered white Americans to lynch black citizens. People were lynched for reasons that included registering black voters, refusing to give up their land to white people, asking for a drink of water, complaining about the lynching of a husband, and eloping with a white woman. The final wing focused on two sentences. The wall read, "Thousands of African Americans are unknown victims of racial terror lynchings whose deaths cannot be documented, many whose names will never be known. They are all honored here.” This wing leads you to the final pathway, which brings you through even more boxes; this is powerful because as you leave the structure you may assume that all of the boxes have been displayed, but there are many more names waiting to be read and acknowledged. Beyond the final box is a statue of Rosa Parks in celebration of the civil rights victories of the 1950s and 1960s but beyond her, there is another reminder of how much we still must do for civil rights and racial equality. The final stop along the timeline of racial terrorism is a statue of a line of black men with their hands held above their heads, a reminder of the all-too-frequent killing of unarmed black men at the hands of the police, is the final stop along this timeline of racial terrorism. Although mass lynchings no longer take place, last year dozens of unarmed people of color were shot and killed by the police. The monument forces the viewer to feel and acknowledge the weight of the history. While at times overwhelming, the structure itself was peaceful, calming even. I found myself sitting and thinking about what I had seen, and instead of feeling bogged down by the weight of the subject matter, I felt empowered. What holds many people back from visiting these memorials is the sadness and reflection they must face, but in order to effect change, we must recognize the past and our roles within it. As a white woman from the Northeast, some may argue that I am not a directly impacted by this history; am I the right person to be reviewing this? People of all backgrounds need to experience this memorial. My experience was drastically different than that of a person whose family has been victims of these crimes, or a person whose family took part in the lynchings. Regardless of background, this memorial should mean something to you. It reminds me of the consequences of apathy and motivates me to engage in the fight against oppression. It reminds me of the innate privilege I have, and how others have suffered and continue to suffer in America due to lack of opportunity, lack of respect, and lack of understanding for those who come from diverse backgrounds. As an architecture student, my profession has been guilty of heinous racism and lack of empathy for underprivileged and diverse peoples. We can either practice through ignorance or thrive by elevating and empowering disenfranchised communities. The Memorial for Peace and Justice screams for just that: peace and justice. While we may like to believe that this history is behind us, the Equal Justice Initiative reminds us that racial terror and inequality did not end, they just evolved. This memorial gives America a place to publicly express the pain and anguish this truth evokes. EJI also created the Museum of Legacy in Montgomery, which chronicles the evolution of slavery into the current system of mass incarceration. Future Firm is a Chicago-based architecture practice founded by Craig Reschke and Ann Lui in 2015. Their work spans a number of disciplines, placing them at the intersection of art, architecture, community engagement practices, and technological innovation. Both founding partners have worked for corporate offices and are involved in academia. After working in offices on mostly foreign, large-scale projects, they started Future Firm to explore how architecture can more methodologically describe and affect the built environment through landscape, culture, and society. Running in conjunction with the 2017 Chicago Architecture Biennial, the Chicago Architecture Foundation (CAF) challenged fifty Chicago-based architects to rethink underappreciated and underperforming spaces in their city. Showcasing their investigations at the exhibition, “Between States—50 Designers Transform Chicago's Neighborhoods,” the design teams were to identify a physical asset in one of Chicago’s fifty wards that could benefit from a redesign and imagine a way to transition it “between states.” The meaning was twofold: first, propose a way to change the state of an underperforming or dilapidated site into a rejuvenated civic anchor; and second, present an inspiring case study of a similar and successful project from another US state or location outside of Chicago. Future Firm answered CAF’s call with a proposal for an Office of the Public Architect. Rather than working in a single area of the city, Lui and Reschke took a more systematic approach to the problem. Having recently opened a practice in Chicago, Lui and Reschke were quite open about the type of projects they would take on. Working on standard residential and commercial projects, they started dealing with the practical and mundane problems of their clients. In this period, and to the surprise of its partners, the office started to receive numerous inquiries and requests from Chicago citizens on another type of work: help in resolving building code violations. The Department Of Building logged over ninety thousand building violations in 2017 alone, according to Chicago’s data portal. About 45 percent of residential field inspections revealed code violations. Building codes go a long way toward ensuring that houses are safe, and it is not uncommon for a building to have multiple violations at the same time. Some building code violations are easy to find, such as missing or defective ground-fault circuit interrupters, handrails without returns, improper bathroom ventilation, missing deck flashing, and misplaced smoke alarms. Other common and potentially dangerous building code violations are hard to locate—and even harder to fix—because they’re buried behind finished walls. These include improper framing, excessively cut and notched studs and joists, shallow insulation depth, improper type and size of electrical wires, and inadequate connections between building materials. The occurrence of building code violations can be an effect of hiring a careless inspector or disreputable builder, or of the house predating current building codes. In the firm’s experience, professional developers or landlords are not usually the ones who call to ask for help. Homeowners seldom reach out for assistance, and architectural services, in this case, have a different dimension when the payer is an individual client. This led Lui and Reschke to think about what happens when a person cannot afford the architectural services needed to bring their building up to code. Furthermore, Chicago is known for having a problem with empty lots and dilapidated buildings. According to Reschke, owners not being able to resolve their building code violations has directly contributed to the empty lot issue. “When you commit a crime, if you cannot afford a lawyer, you have the right to a public defender. When issued a building violation, should you also have the right to a public architect? People could go get guidance, get architectural plans, have a way to fix their violations,” Reschke says. Future Firm proposes opening an office that would provide services to those who can’t otherwise afford them. Future Firm envisions this office as an easy access resource for design, architectural work and bureaucratic building code resolution procedures that would offer a faster, compassionate, and dignified service to its citizens. In regards to prospective employees, they see this office as a good fit for early-career architects to gain on-the-ground experience and a chance for senior designers to engage in community-based work. There are precedents to pro bono work within the field of architecture. Some architecture offices lend their services for free to communities in need and nonprofit organizations that genuinely cannot afford to pay market rates. Others, such as Public Architecture, serve as a connection between such nonprofits and architects willing to contribute. However, Future Firm’s proposition avoids charity and donations, relying on taxpayer dollars. Lui and Reschke understand that this concept might seem a bit far-fetched. However, the same was originally said of the idea of a public defender. Clara Foltz, California’s first woman attorney, proposed the idea at the 1893 Chicago World’s Fair. She saw the public defender as a counterweight to public prosecutors, having equal funding and stature. Though Los Angeles opened a public defender office in 1913, it wasn’t until 1963, in the case of Gideon v. Wainwright, that the Supreme Court decided that states must provide legal counsel for those that cannot afford their own. Thinking about underutilized space in the framework of CAF’s multi year strategy for Chicago, Future Firm positions the Office of the Public Architect in the unused spaces of post offices. Regarding the post office as a central civic space of society, it would be a perfect fit for the proposal, taking over empty post office windows in a number of wards in the city. From these windows, the public architect could work on behalf of Chicago’s citizens through collective investment in the city’s architecture. Clara Foltz's idea that “the law should be a shield as well as a sword” grew mainly from her experience representing underprivileged citizens in the western courts. Future Firm’s idea is a big one, but the firm believes it has the political will to achieve it. Examining the existing structures of society in regard to public service and human rights has put this office on the map of activist thinking within the architecture and design industry. We all deserve safer and more humane living spaces—and we all deserve dignified means of achieving them. Projects like this bring us closer, one step at a time.